Willa Johnson used to work for the state as part of a program that feeds hungry schoolchildren. When Willa Johnson makes you a meal, she can't guarantee it's good for your health, but she will promise it's great for your soul. "I cook with a lot of sugar, butter and love,” Johnson said. “And when you’re cooking from your heart that makes it even better." 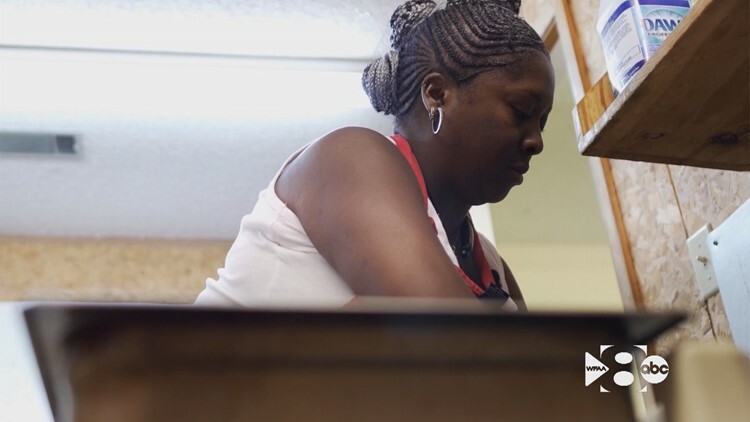 Willa, who owns a catering business fittingly named The Soul Kitchen, pours so much love into her cooking, that much of the money she makes catering she then spends feeding hungry children. "If a kid is hungry and they wanna eat, I will feed them," she said. But what's most impressive is how far Willa goes to make it possible. Every week during the summer, Willa leaves her home in Fort Worth at about 1 a.m. She then hops in her 2005 Ford Freestar van, drives more than 100 miles to the small city of Athens, where she begins cooking before 3 a.m.
"God put people on this earth for certain reasons, and I think this is my calling,” Johnson said. Willa used to work for the state as part of a program that feeds hungry schoolchildren. That job took her to cities all over North Texas, including Athens. A lot of kids in Athens live in poverty and during the summer, sometimes go hungry. Most cities Willa visited had summer programs to feed the kids, but not Athens. For Willa, that was it. "God put it on my heart,” she said. She quit her job, opened a kitchen and today, the 51-year-old grandma and her army of helpers drive around Athens dishing out lunch to hungry kids. It's a program she calls Feeding Kids Right, and she does this five days a week, all summer long. In just one day, Willa serves nearly 300 full course meals. She’d like to get enough donations to do this year-round, but for now, a lot of it comes at her own expense. Willa has given most of her savings feeding these kids. "When you have it in your heart and it's your passion, it's not going to bother you at all,” she said. “God put people on this earth for certain reasons, like he put me here to cook for these kids." She doesn’t make any money, but Willa is paid handsomely in hugs. "That hug, that's just like giving me a million dollars," she said. As you might expect, so much sugar, butter and love can have a dramatic impact on the heart. And it has. Some kids have told Willa when they grow up, they want to help their community just like her. In fact, many folks here believe, Willa is, quite literally, a gift from above. "She’s one of his angels that He sent to us,” said the grandparent of one child. Willa thought she needed a good meal to feed kids right, but found out what really satisfies is the love behind it. A GoFundMe has been created for donations.